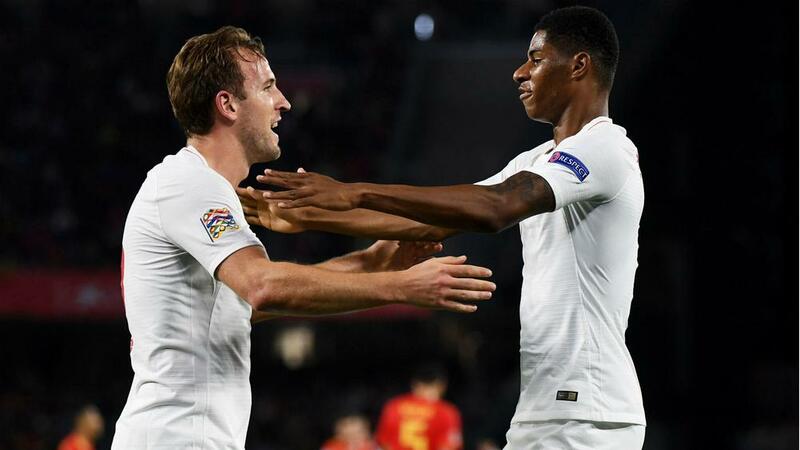 Marcus Rashford can go on to reach the levels set by Tottenham star Harry Kane, according to Manchester United caretaker boss Ole Gunnar Solskjaer. Rashford has thrived since Solskjaer took temporary charge at Old Trafford, scoring in three of his five appearances under the Norwegian. And Solskjaer sees no reason why Rashford cannot live up to the standards set by his England team-mate Kane, who will likely lead the line for Tottenham at Wembley on Sunday as they take on United in the Premier League. "He can become a top, top striker," said Solskjaer, whose counterpart in Sunday's clash – Mauricio Pochettino – is regarded as the favourite to take over at United. "We can talk about Harry Kane and his class and I'm sure Marcus as well has the potential to get up there. "He has got frightening pace, he's becoming stronger, he can now hold the ball up for us, he's a great link player." Solskjaer, who took United's squad to Dubai for a warm weather training camp following their FA Cup win over Reading, added that Rashford's graduation from United's famed academy makes the striker even more likely to succeed. "He's been brought up here so there were a couple of sessions with the young kids," he said. "[Tahith] Chong, Angel [Gomes] and him, they play together in a certain way so he's a very exciting player to work with."